Thanks guys for listening and making Insight.ly even more awesome. I can not get this to work. I cannot EDIT event/task/milesone in ical on my iphone. Any suggestions?? Cannot edit the 3 calendars via Google Calendar (web) here either w/ 2-way sync turned on. Can anyone edit these calendars outside of Insightly? So Insighlty calendar not just a feed anymore? The message displayed in my insightly dashboard that brought me here mentioned paid plans. I'm new to insightly but haven't seen any mention anywhere about paid plans. Can you let us know what paid plans are all about (cost and benefits?). 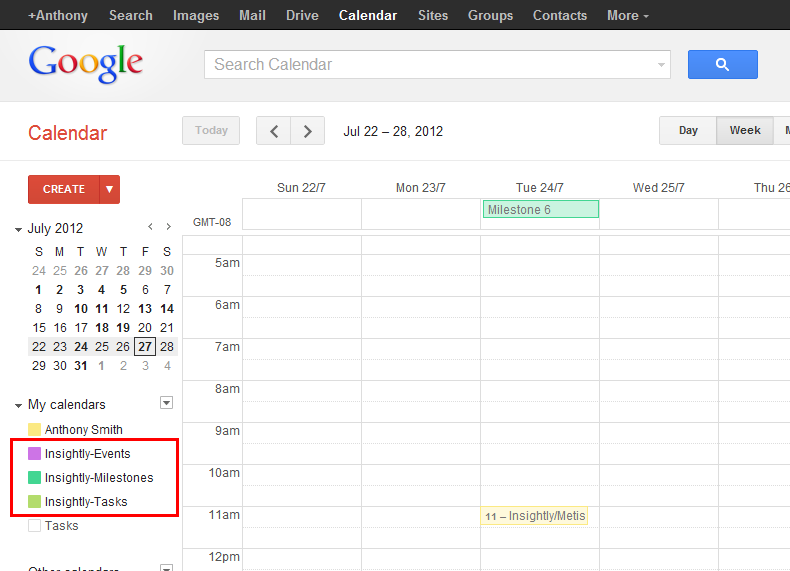 It shows in my Google Calendar, however all of my Google Calendar events are not showing in my Insightly Calendar. I did the "2-way Sync", however my people do not know when to schedule my events/appointments within Insightly if they don't know what my appointments/events are in google calendar. Same as KentLevi-- The Insightly one's show up in the Google Calendar (although they're under new calendars called Insightly-Events, Insightly-Milestones and Insightly-Tasks), but the 2-way syncing from Google to Insightly is not working-- none of my calendar events are coming up in Insightly. So I tried adding 2 new events to the Insightly-Tasks from inside Google Calendar (1 whole-day, 1 shorter 2-hour), and apparently Insightly didn't like that, and deleted both of them! Also, since the Insightly items only have a calendar day marked and not a time, they're set for "all day" which is terrible if you have several things set for a day... nobody can tell what's going on in Google Calendar... and you can't mark them as completed in Google Calandar on top of that. And finally, Google Tasks, which are part of Google Calendar (and can be checked off in the calendar), aren't syncing to Insightly either. You misunderstand what the Insightly calendar sync does. 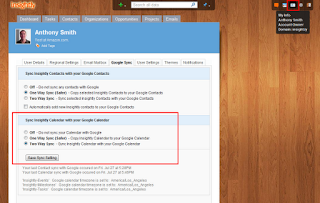 It sync's your Insightly tasks, events and milestones to your Google calendar - it does not sync events from your Google Calendar back to Insightly. You can update Insightly tasks and events in your Google Calendar if they originated from Insightly, but you can't add new items from the Google side. We have grown with this product. Your product is evolving with feedback from users. It is an affordable solution for our business. People who want "perfect" may well be sophisticated users, and thereby should investigate salesforce at $10,000 a licence. this is a step towards a true sync, but so much of what we do is based out of our default calendars tied to our gApps accounts - not added calendars. 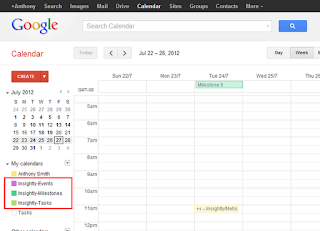 When Insightly is able to integrate events created from gCal, then we're talking something substantial. Until then, we'll be keeping calendar sync off. Can you please just add the Insightly calendar to Insightly mobile? This way I can maintain just one calendar. As it is now, you have to use both Google and Insightly calendars on our mobile phones. If I'm at a meeting and want to set an appointment, I can see when I have available time in Google calendar but I have to create the event in Insightly. A simple solution would be to make the Insightly calendar available in Insightly mobile. I have lost count on how many requests I have read asking for an Insightly calendar in the mobile app. And never once have I seen a response from Insightly. This is a must needed and asked for service, but your silence on the matter is very annoying. Please address this issue with an answer. I totally agree NO SYNC is better than PARTIAL SYNC for the most part. Otherwise it just creates headaches and missed appointments...NOT GOOD...but commend you for the continued progression. Who is going to fully integrate the two? Google needs to contract you guys build this. Why don't you add a plugin in google calendar, such as the one done for gmail ? The integration done in gmail is very good! Just the same in google calendar would be awesome for me. Objective : to maintain just one calendar. The CRM is not the center of my life, and the user-friendliness of google calendar is the best I know. Thx to Insighly: great job! I agree...really need to have a functional calendar ability in Insightly. I need to track appts by contact, but I am unable to schedule appts in Insightly because I typically schedule 2 employees per appt and can only schedule for myself. In addition, I need to often schedule reoccuring appts but can not do this either. So, I can only use my Google Calendar but then I am unable to track those appts to my contacts. I think a calendaring system that works can can be utilized and seen on a phone is a must. Especially for your paying customers, which I am one. The calendar feature and the task feature must be improved greatly in order for this to be functional. Why are we not able to invite people to a meeting we have created or when setting task for my team or another individual in the office.? This makes no sense. Are You currently working on improving the "two way sync" functionality also to include oringinally created Google Calendar tasks/events into insigthly? It appears that I am only able to post tasks to my google calendar and not a coworker's google calendar. Am I missing something? uh oh. 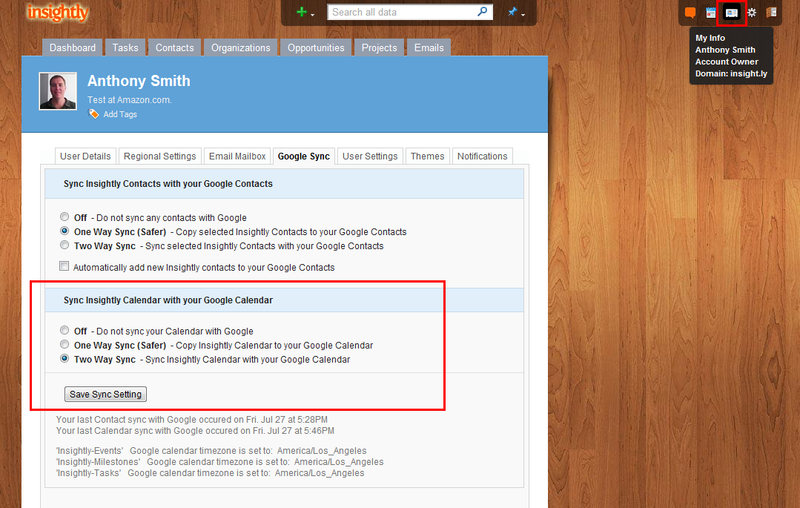 Until events originated in gCal are reflected back in Insightly, I would call it 1-1/2 way sync. I just wasted a bunch of time troubleshooting until I reread this page and comments carefully. Almost there guys. Doin' great.